OUCH!!! Did that house fly just bite me? | Ah The Things I've Done! OUCH!!! Did that house fly just bite me? The flies of autumn are upon us! As the weather gets cooler, the flies want to be inside, where the temperatures are steadier and warmer. In the evening, if there has been an opportunity to enter your home, you will find them crawling around on TV screens, and buzzing around lamps. They also seem to be drawn to body heat, and a person at rest is a perfect target. This happens especially outside as the sun starts to set. If you have exposed skin, say an arm or a leg, they will swoop in and land, stealing your warmth, and driving you insane, as they crawl around with their filthy fly feet! You drive them away, but they just keep coming back, and every once in a while…OUCH! You just got bit by a housefly! While world wide, the fly most encountered around humans are house flies, you will also be buzzed by their numerous look-a-like cousins! We often see the blue and green bottle flies…Those are the ‘houseflies’ that look to be blue or green, and because we see them in houses, we may generically call them ‘houseflies’. True houseflies however tend to be very dull in color, and have very light, or dirty looking yellow markings on the abdomen, and thorax. 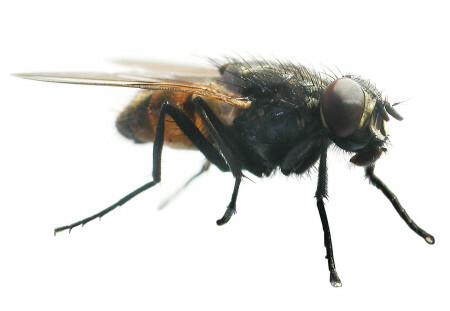 All of these flies love to come into our homes, to search for rotting food or to stay warm, and you will find all of them on dog poo, and dead critters…But they don’t, or more appropriately can’t bite you. Their mouths just aren’t built for biting into living, healthy skin. Now I know, everybody out there either claims to have, or knows somebody that claims to have, been bitten by a housefly. They may even be 100% positive in their minds that a housefly bit them, and they most likely even have credible witnesses to prove it. The fact is, if you were bitten by what you would swear on your most prized possessions to be a housefly, the vicious little demon actually doing the biting was very likely a stable fly (Stomoxys calcitrans). These flies spend most of their time buzzing around sunny open areas, but when the weather is not favorable will seek out shelter in our homes, and barns. You will also find these pests tormenting your livestock, as well. The female stable fly must have a blood meal in order to lay her eggs, and she will lay those eggs in rotting hay, straw, and grass clippings. Large hay feeders, or large round bales of hay, also make perfect places to lay their eggs. If you live near a farm, a place with outdoor pets, a hayfield, or even a park, it makes it all the more likely you will find them buzzing around and trying to bite you! So there you have it! 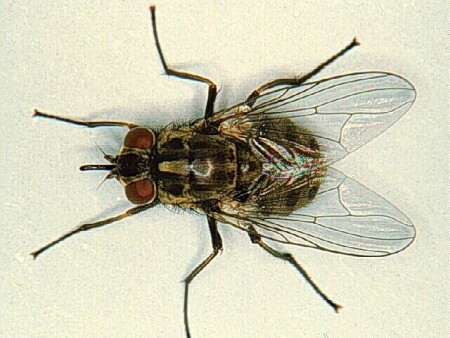 Houseflies don’t bite, but you can get bit by a fly in the house!